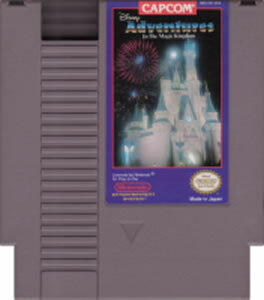 Disney's Adventures Magic Kingdom original NES Nintendo Game cartridge only - Cleaned Tested and Guaranteed to Work! A better game than you might think. It's not too long, has plenty of variety and just the right level of challenge that it's more fun than frustrating. The cartridge itself arrived on time and in perfect working condition, as usual. I got tis gameafter tring a copy belonging to a friend. I was at best a casual Disney fan, but this game surprisingly floated my boat, wet my whistle, whatever expression you might choose to use. You play as a kid who's been tasked by Mickey Mouse to find six silver keys needed to ope the gates to the enchanted castle in time to start a parade. While one of these keys is fairly easy to get, at least if you know your Disney trivia, the other five must be accessed by completing five iconic Disneyland attractions. 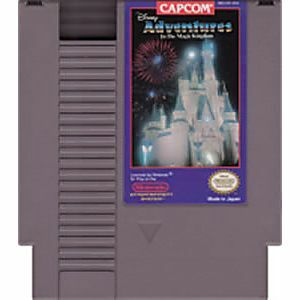 Of course this game having been released during the fruitful years of Capcom's partnership with Disney, the game is much more enjoyable than you might expect. The gameplay is actually quite varied. You spend part of it walking through the park answering the trivia questions of the various NPCs. Answering all of them will net you one of the six silver keys. Then you have to approach the five attractions, at the beginning of which you'll be briefed on your objective. Surviving to the end of the ride will net you one of the keys. The five rides are Space Mountain, where you have to fly from one star to the next with the help of a navigator, Big Thunder Mountain, where you ride a mine car through a dangerous cavern full of rolling boulders, Autopia, where ou have to race against the evil Panhandle Pete to regain the key he stole, Pirates of the Caribbean, where you have to rescue six village maidens and then light a signal fire allwile avoiding te pirates and teir deadly traps, and finally the Haunted Mansion, where you have to explore the famous haunted mansion, avoiding all kindsof deadly traps ad fighting off ghosts. Be careful though, all but one of thhe rides, that being Space Mountain, have a time limit. If the time runs out, you die. Also in most of the rides you can take three hits or make three mistakes before you lose a life. Autopia is much more difficult since running off the road or falling off a bridge is instant death. Fortunately though you aren't entirely without options. Most of the rides, the best being Autopia, allow you to earn stars which are this game's currency. You can carry up to 99 stars, and believe me, you're going to want all of them. While walking around the park and in some cases during the ride levels themselves, you can press select to access a menu of things you can buy, among them an extra life (you can have up to nine), having one heart restored (which works until you're at max), temporary invincibility, and the ability to temporarily freeze enemies. You'll find yourself making use of most if not all these at one point or another during your quest to find all the keys. The audio, aswas usualy the case in those good Capcom/disney years, excellent. Generally the music fits the level it was used on and the sound effects get the job done. The ones most likely to annoy you the most I suspect are the death theme and the timer warning. Overall this is definitely a gameworth owning. It's fun and challenging without being brutally unfair. Fun to pick up and play. Not a great game but I've played much much worse. I don't like that you play as a little kid and not as any of the Disney characters but such is life. one of the greatest games ever made. our friend carps dosen't like it because it's disney and he's baked and is against disney today. great game. 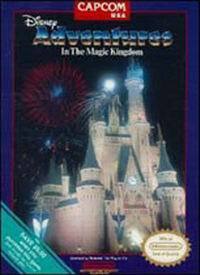 I'm not someone who's ever been interested in going to Disneyland, but if I thought it would be as enjoyable as this game, I would go in a heartbeat. You play as a kid who has to find 6 silver keys to open the gate and start the celebration. You'll need to survive a race against Pete, walk through a haunted mansion and avoid asteroids in 5 iconic Disney attraction. The game's not too difficult, considering it's probable target audience, but can be frustrating if you miss a few things or don't know what you're doing. Also, the game just kind of ends (I was hoping for a final level...). Regardless, it's fun to pick up and just play through quickly and is a solid compilation of games.